Soda gets a bad rap these days. No one—certainly no one with foodie cred—wants to get caught drinking a “soda.” Or a tonic, or a soft drink, or whatever sweet fizzy drinks are called in the region you hail from. But what if you could have a delicious and refreshing bubbly, sweet or savory soda, in fantastic sparkling colors, with no added junk, no artificial anything? Mamaleh’s, a new fixture in Kendall Square, calls itself a “delicatessen restaurant.” The white bright open space has a wonderful throwback deli charm coupled with an of-the-moment hipster vibe. A huge side of irony coupled with bona-fide great classic deli favorites. It’s eat-in or take-out, with a ready-to-go marketplace stocked with classic deli staples. (I was thrilled to see hard-to-find Fox’s U-Bet Syrup on the shelves). There is an onsite bakery for bagels and pastries, and possibly the best smoked fish selection in town on display in the deli case. At the center of the dining space is the bar and soda fountain. If you were to close your eyes and call up the classic American soda fountain with swivel stools, laminated menus and lots of chrome and marble, that’s the vibe at Mamaleh’s. Co-owner and Bar Manager Evan Harrison says, “To begin with, we were just going to do egg creams. And maybe our own take on Dr. Brown’s Cel-Ray Tonic.” Harrison explains that deli food needs flavor contrasts. A rich, fatty pastrami or corned beef sandwich needs to be paired with a sharp fermented flavor. “A little bit of ginger, or mustard, the sharp tang of a pickle,” he says. “That’s why a Reuben sandwich works so well.” And doesn’t a plate of whitefish or Nova cry out for a glass of Cucumber Soda or a sip of Pomegranate Ginger? The idea evolved from the initial idea of the egg cream. Mamaleh’s now has over 10 homemade fountain drinks on its menu. Here’s the list to lust over: Beet Soda, Cucumber Soda, Raspberry Lime Rickey, Lemon Cardamom, Pickles the Great, Angostura Phosphate, Vanilla Cream Lactart, Limonana, Chocolate Phosphate, Cherry Phosphate, Local Strawberry Lactart and, my own personal addiction—Pineapple Lactart. All are concocted with house-made simple syrups, fresh fruits, vegetables and herbs, sparkling water, shrub vinegars and a few less familiar ingredients. And they are to die for. The best news: We’re going to show you how to make a few of these sodas at home. Perfect for a summer quench, with or without alcohol. Delis and soda fountains both came of age in the late 19th century as immigrants flooded New York. Both remain classic concepts and they come together happily at Mamaleh’s. Delis are typically daytime haunts rather than nightspots, and given Mamaleh’s location in the center of white-collar biotech and IT offices, the owners did not see a strong daytime demand for alcohol. “We knew we weren’t going to serve a lot cocktails at lunch in Kendall Square,” says owner John Kessen. Maybe a beer after work with a pastrami sandwich, or a Bloody Mary for Sunday brunch? But a soda fountain, masquerading as a bar, with cool, gotta-try-them house-made sodas? That had legs, and was certainly a kick up from serving a Coke or a ginger ale. Or even bottle of Dr. Brown’s. Working together, Evan Harrison and lead bartender Linden Marno-Ferree began a deep dive into the alchemy of carbonated drinks. Both have academic pedigrees that prepared them to research deep and wide. Evan studied literature and philosophy; Linden is a graduate level Russian translator. As mixology professionals, they thrilled to the challenge of creating a menu of non-alcoholic drinks. They borrowed from the past, searched globally for carbonated favorites to adapt and went plain crazy experimenting with their own palates. What about making non-alcoholic soda with pickle juice as a correction to a big juicy smoked meat sandwich? “What the heck?” Marno-Ferree remembers thinking. And then someone saw it and wondered how it would be with a shot of bourbon. “We were all over that,” she says. The goal at Mamaleh’s is to keep the soda fountain drink menu to 10, with a few flavors cycling in and out so there’s always something new to try. While there’s daily work creating new batches of the soda bases, most of the flavor bases last in the refrigerator for two weeks or more. Creating your own home soda fountain is mercifully easy, with a simple equipment list and setup. You’ll need a source of carbonated water (a bottle of purchased club soda or a Soda Stream will work), some ice, a pot to boil in, a stovetop burner, a fine-mesh sieve, a whisk, measuring cups and teaspoons, and possibly a blender or a juicer. Most of the recipes begin with simple syrup, an easy kitchen staple to make or—even simpler—to buy. Two other ingredients—Acid Phosphate and Lactart—are a little harder to come by but are available for purchase at Mamaleh’s or online. Acid Phosphate, a natural and safe ingredient, keeps the drinks clear and adds acid balance to the flavor. 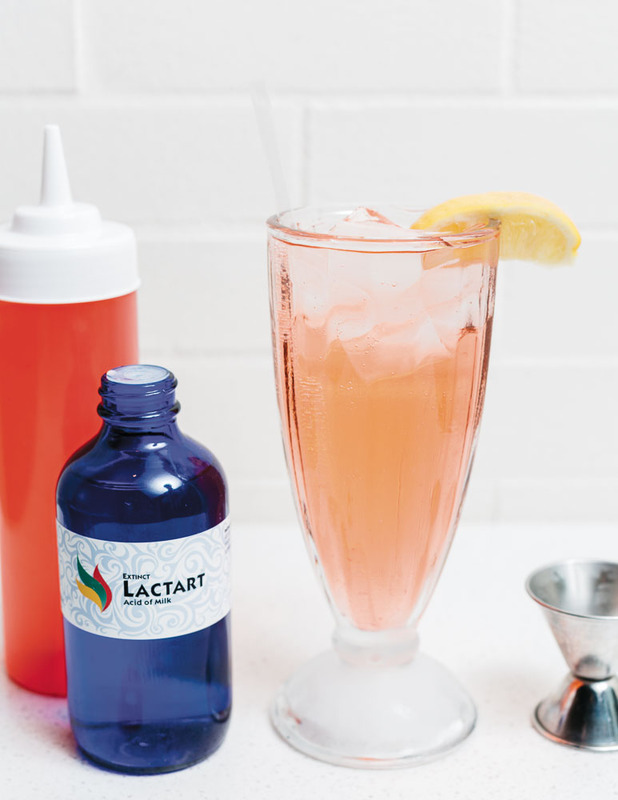 Lactart, a tart milk acid similar to yogurt, also adds a balancing acid but brings a slightly different color and consistency to the drink. 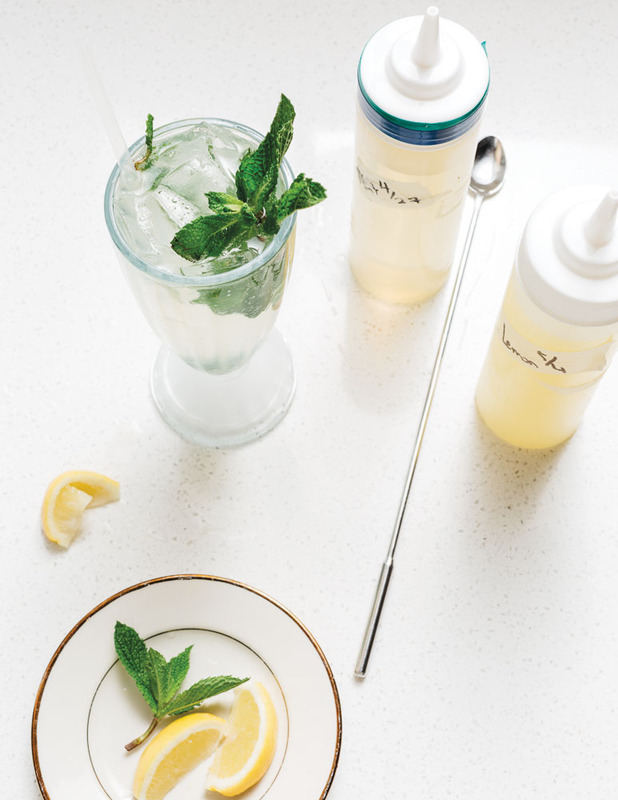 These recipes are non-alcoholic, but the Mamaleh’s team encourages you to try adding your favorite spirit to these decidedly adult sodas. When adding alcohol, try adding 1½ ounces of your mixer to the ice and syrup, and cut back on the soda water to taste. In a small saucepan, bring sugar and water to a boil; simmer until the sugar is dissolved, 3 minutes. Remove from the heat and let cool completely. The syrup can be refrigerated in a glass jar for up to 1 month. If you need to store it longer, it can also be frozen. Combine all and add to glass. Fill halfway with ice. Top off with soda water, stir and enjoy. Suggestion: add 1½ ounces bourbon or rye for an alcoholic cocktail. Bring to a boil, let simmer for 10 minutes. Remove from heat. Cool in a glass jar. Keeps refrigerated for 2 weeks. Combine all ingredients in a glass, top with soda water, stir with spoon to combine. Garnish with fresh mint leaf and serve. Suggestion: Add 1½ ounces mezcal for an alcoholic cocktail. Combine all ingredients and whisk until the sugar dissolves completely. Strain the mixture with a fine-mesh sieve. Transfer to a glass container. Refrigerate. 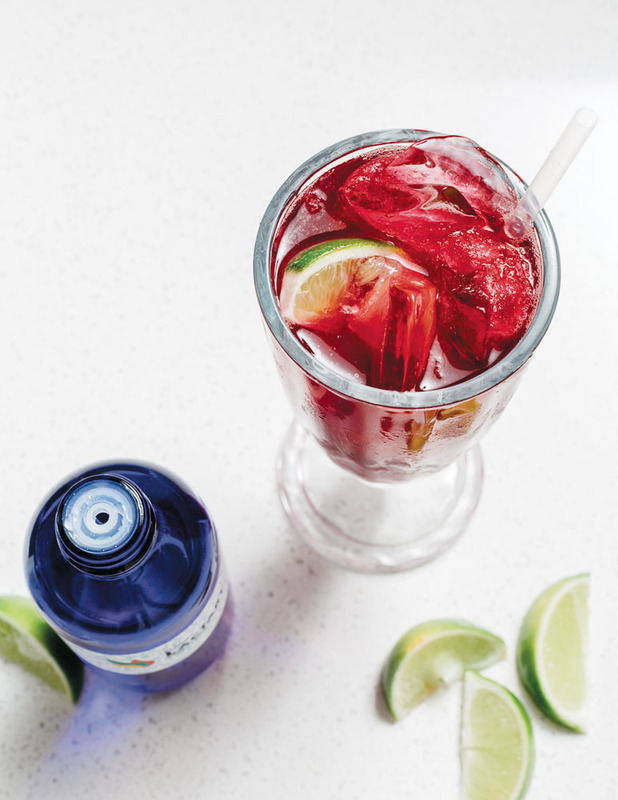 Add beet shrub and Acid Phosphate to glass, stir and garnish with fresh lime. Suggestion: Add 1½ ounces vodka or gin for an alcoholic cocktail. Melt sugar and chocolate in a saucepan with 1 cup of water. Bring to a simmer and whisk until smooth. In a mixing bowl, whisk together cocoa powder and cornstarch, then cool liquid chocolate mixture slightly and whisk into dry ingredients. Return all to heat and whisk together over low heat until thickened. Cool in a glass jar. Add ice and soda water to glass to fill. Stir to combine and garnish with a cherry. Place strawberries in a heatproof bowl. In a saucepan, combine sugar and water. Heat and stir until sugar is dissolved. Pour hot syrup over the strawberries and let sit for 4–6 hours, stirring occasionally. Strain into containers. Fill glass halfway with ice, add syrup, lactart and soda water. Agitate to combine all ingredients thoroughly. Garnish with a strawberry slice. Suggestion: Add 1½ ounces rum or tequila for an alcoholic treat, and garnish with a lime.